Nicolas Flamel was a well-known manuscript-seller and French scribe. After his passing on March 22, 1418, he became known for his reputation as an alchemist. Many believed that before his death, he had discovered the Philosopher’s Stone and thus achieved immortality. 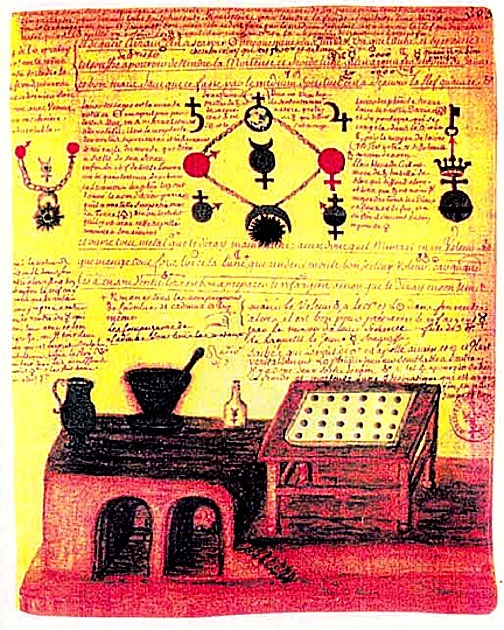 The image you see here is an excerpt from Nicolas Flamel’s personal notebook or journal. He wrote many a thing on the concept of alchemy and the Philosopher’s Stone. According to texts that were later ascribed to Flamel – which means attributed to him – nearly 200 years after his death, he had learned a variety of alchemical secrets and mysteries from a Jewish converso, on the open road to Santiago de Compostela. A converso is a Jew that converts to Catholicism, more commonly this happened in Spain and Portugal. Flamel lived during the fourteenth and fifteenth century in Paris. He lived well into his 80s and actually designed his own tombstone which had depictions of Christ, Saint Paul and Saint Peter on it. One of his houses still stands in Paris to this day. It is located at 51 rue de Montmorency and is recognized as the oldest stone house in the entire city. Was Nicolas Flamel Really an Alchemist? There is no historical record that purports the real Nicolas Flamel from history was actually involved in alchemy, pharmacy, or medicine. In fact, many stories of him as such claim that he had an inordinate amount of wealth, but his will – which dates back to November 22, 1416 – revealed that he may have been a generous philanthropist but not actually wealthy. Whatever the case may be, a great many subscribe to the idea that Nicolas Flamel did indeed find immortality thanks to help from an unknown source and that he recorded his knowledge and expertise in a personal journal, which you can see represented in the picture above.